According to studies, time spent in green spaces can decrease stress and depression, improve our immunity and relationships, and even fight ADHD symptoms yet, the average amount of time Americans spend in a natural space has been dropping every year. Specifically, statistics show a 1% drop in the percentage of Americans that fish, hunt, camp or hike every year since 1980 and many people now report spending as little as 10 minutes a day on average outdoors – the time it took to get to or from a car. Without getting into a lecture on the evils of screen time at our jobs and at home, mentioning the environment we evolved with and the phenomenon of captive stress, or pointing out the relationship between the rise in mental health problems and the drop in outdoor time – eh ehm! ( Ecotherapy: Nature As Medicine ) – I believe it’s safe to say that we could all benefit from more time spent around plants. Still, as a writer, I’ll admit, I myself spend far more time in front of a computer than I’d like. While the ideal solution would be to get out into nature every day, what are we to do when our livelihood requires we be indoors, and our home is in the city? If we can’t go to nature, why not bring nature to us? Though, I’m lucky enough to have woods in my backyard at home, I work inside a cubicle, that is inside of an office whose only view of the outdoors is a window that looks out another window and that secondary window’s view is the side of another office building (it’s like a Russian nesting doll of soul-crushing indoor living). In this setting, only the shade-loving-est of shade loving plants can survive. I know. Though, my cube is fairly full of greenery, I’ve gambled and lost on several part-sun pipe dreams – most recently two miniature shrubs. I stubbornly held onto their dried remains for about a month before I decided they were fully dead and depressing, and it was time to let them go. But what could I keep growing in the darkness to replace them? Suddenly it hit me – moss. 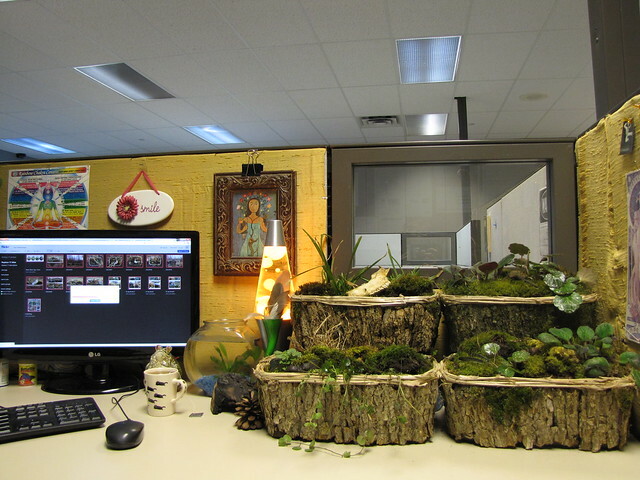 If moss could thrive in the darkness of my woods’ canopy, maybe it could work inside cube! Even if I couldn’t be outside, or even see it, I’d have a little piece of the woods near me all day in my Japanese style moss garden. Want to make your own? Optional: African Violets & two additional storage containers of the same size (for propping). 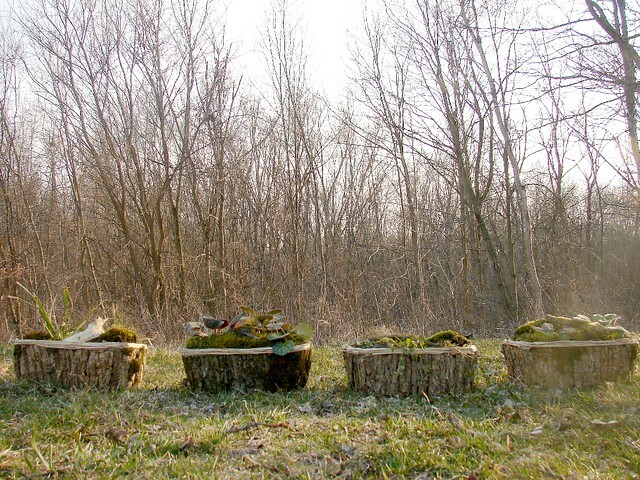 Plants: Armed with a container to bring back your findings, head to the woods. 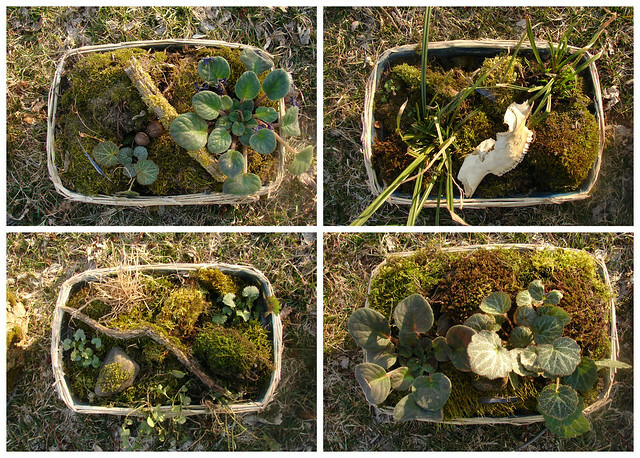 For the most interesting look in your wilderness garden boxes, aim for wide variety of moss types. Look for different shades. Try both spreading and clumping moss. I found a few twigs and rocks with moss growing on them that I picked up. I also dug up a couple small plants and grasses to add in to the scene. Be sure to take some extra dirt from the same place you collected your plants. This is your best bet for easing what can be a somewhat stressful transition for plants. I already had violets that worked well with the scene, so I used those as well. When you’ve collected all you need to fill your boxes, you’re ready for arranging. Moss need only be placed on the surface of your garden, so add enough dirt to nearly fill your containers (preferably, dirt from the place you found the plants). Dig holes and plant anything that you dug up (grasses, ferns, small plants ) before adding your moss. Aim for a variety in each box covering all exposed dirt. Scene Setting: Be on the lookout for other interesting little things to add to your garden. I found some blue bird feathers, nuts, and a deer skull fragment to complete the woodland scene. I would have loved to have found some mushroom covered twigs or even small mushrooms, but unfortunately had no luck. Beautiful little leaves, shells, or flowers would also have been nice. I divided these evenly between the boxes. 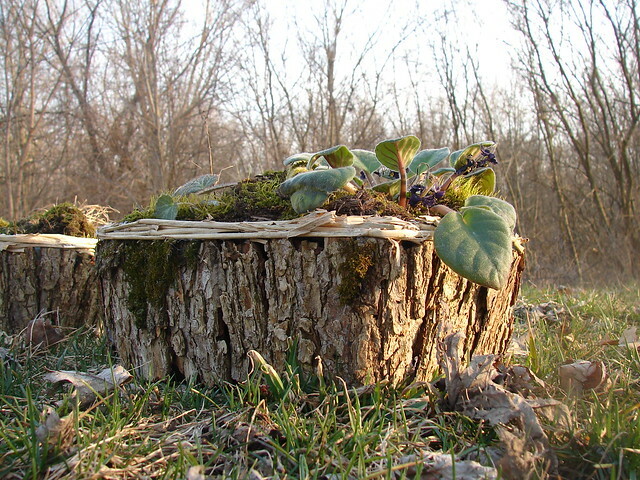 Though I aimed to keep boxes looking natural, it’s an idealized sort of nature, so I removed any crumbly dried leaves. I collected fallen bark (Please do not tear bark from trees! This leaves them vulnerable to disease.) and tall dried grass to decorate my plain plastic storage containers. Measuring against the side of my containers, I broke off pieces of the appropriate height (You’ll want vertical bark lines to keep things looking natural.) and aimed for just about 3 inches wide. (I tried using wider pieces at first, but felt they were less stably attached than I was comfortable with.) Don’t worry if there are exposed lines between the bark pieces or if the pieces you break off aren’t perfectly squared off. You can break up and glue on appropriately sized bark pieces to cover any exposed area. To enhance their look, I added pieces of moss or lichen covered bark around edges, taking care to keep pieces looking organic and not too squared off. I finished off the boxes gluing bunches of the dried grass so that it covered any exposed lid on the boxes. Pull off any hot glue strings. 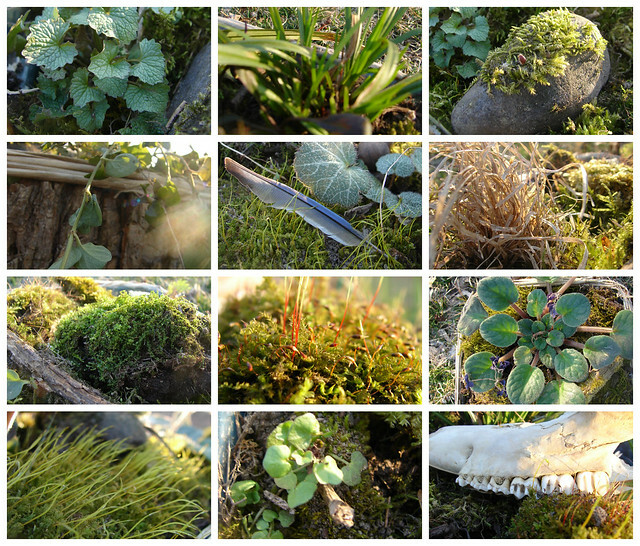 There are actually around 12,000 varieties of moss worldwide and all have slightly different care preferences. In general though, the goal will be to replicate their natural environment as closely as possible. 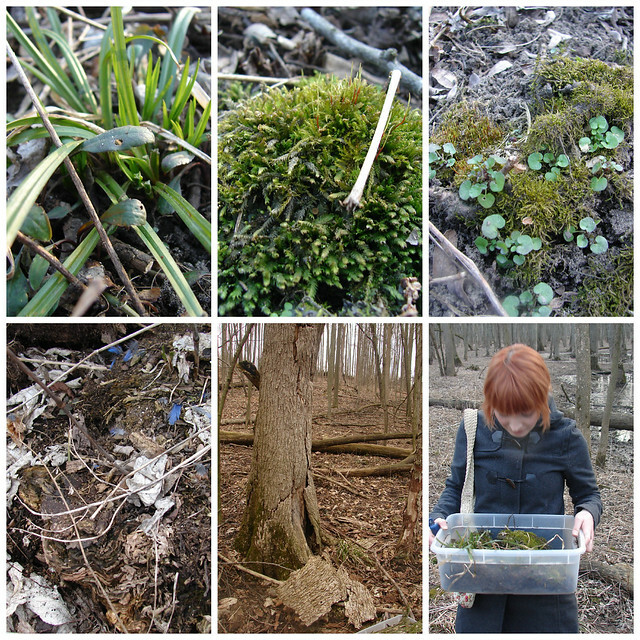 As a reminder, be sure you have permission before taking moss or other wild plants and do so respectfully. Take only small amounts, not entire colonies, and don’t remove moss or any other plants from national parks – it’s illegal. Planting: Place moss on dirt from the area it was collected. You’ll have noticed while collecting your moss that it has no true roots and so there is no need bury it. 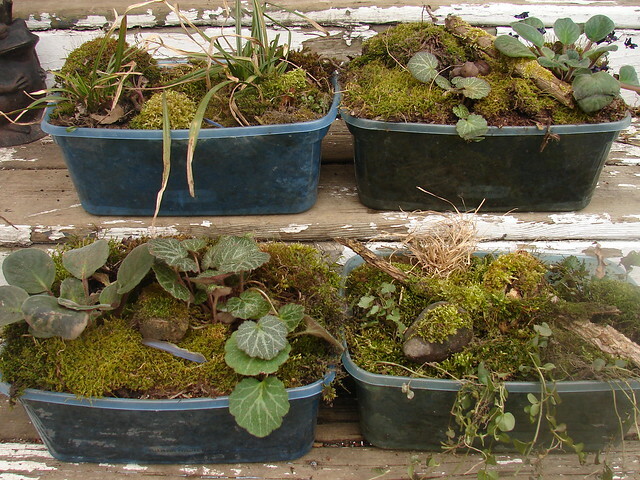 Watering: Especially after their initial transplant, it’s important to keep moss moist as it rebinds to the soil. Ms. Martha Stewart recommends regular spraying and twice weekly water for moss, though warns against over-watering and creating a miniature swamp. A friend at work was kind enough lend me some algae fertilizer to add to my water. He swears by it and since it was a natural, I figured it couldn’t hurt! Dying moss? If, despite your best efforts, your moss seems to be taking a turn for the worst, you needn’t suffer the guilt of killing nature. Experts say that you should be able to place moss back in an environment similar to the one you found it and have it rebound fairly quickly. Goffinet, Bernard; William R. Buck: "Systematics of the Bryophyta (Mosses): From molecules to a revised classification"
nice job Erin - way to be creative! "it’s like a Russian nesting doll of soul-crushing indoor living"
Good for you for getting outside and getting your hands dirty! Your Wilderness Boxes look amazing! Thanks, Kyle! Obviously, I love the woods, so it was no thing for me to get out there. Luckily, the weather cooperated and gave me some nice warm days and held off raining this weekend! Those are pretty awesome. The bark/tree trunk look is kind of amazing. It is also very cool that you can just put the moss back and it will be OK. Most plants (in my experience) that start downhill end up done for.